Piper! She's one of my favorite characters in the Fallout. The little details are great. Very cute! I love the style you used. It's unique and very stylish. Have a great birthday November babes. We are still working on getting the cosmetic aspects of the forum figured out. Please pardon our dust and hang in there with us. We hope to have everything fixed soon. It is a bit more complicated than we thought it was going to be to update. 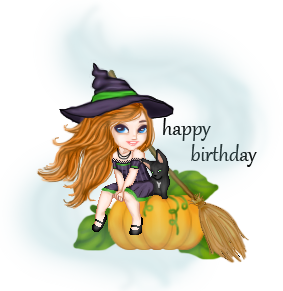 Have a witchy birthday, October babies. We are still working on getting the cosmetic aspects of the forum figured out. Please pardon our dust and hang in there with us. We are still trying to upgrade everything. It is taking a bit longer than we thought. But we do have some news the upgrade was successful now it's just the cosmetics of it! We hope to have everything done soon and in time for the holiday season. GLAM is celebrating it's 10th year as a forum! Em is being a bit of a diva and delaying our events. Gina is just going to have to crack the whip soon and get her going. Look for them soon. Topic: Challenge #126: Make Your Own Charm! Re: Challenge #126: Make Your Own Charm! Name your 3 favorite base makers. I got a promotion at work last week! \o/ I am now Head Teacher which basically means I am third in charge along with another teacher at work. So when the director, coordinator and the other teacher (she is in charge in the mornings, I'm afternoons) isn't there I'm in charge. I got a raise too. Our Black History Month contest has been extended!! A little art feature to get your creativity going. Actor's Challenge this month is Rose Gold! New events coming soon! Keep an eye out for updates to the announcements! Welcome back! I love seeing all the "old" dollers coming back. You have improved since you were last here. That is always a joy to see. We got our tax return back already. Yay and I got a new laptop! Which means I can finally get back to dolling! I've been itching to doll for sooooo long. Topic: Lots of comebacks, huh? Re: Lots of comebacks, huh? Welcome back! We're so happy that you decided to come back! I think I remember seeing your dolls years ago. They are gorgeous. I can't wait to see what new dolls you come up with. If you have any questions about the forum feel free to contact any of the staff and we'd be happy to help. I got like 4 or 5 books for Christmas! I am so excited to read all of them. I am going to move this to the dolls section. Since we don't post dolls in the Tabloids area. Also thank you. The doll is very cute. Topic: Redoll 2017 - The Gifts! Re: Redoll 2017 - The Gifts! Thank you! They all look so great!